This tool will allow you modify the internal resolution of Pro Evolution Soccer 5 / Winning Eleven 9 & Winning Eleven 9 Liveware Evolution in real-time. This is useful for if you are using a patched exe, or if you have a low PC. 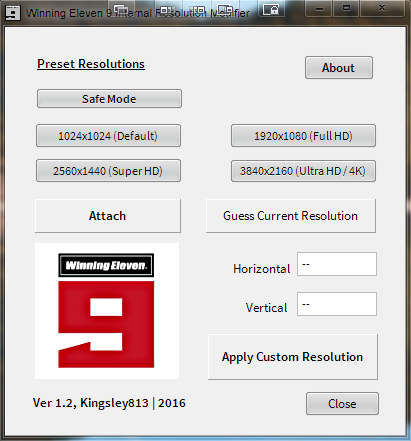 There are preset resolutions to choose from, or you can make your own. NOTE: THIS TOOL MUST BE OPENED EVERYTIME YOU PLAY THE GAME, AS IT IS NOT PERMANENT. 1. Extract the .rar file anywhere you like. 3. Now open the Internal Resolution Modifier. 4. Choose a resolution from the list. a. If you want to find out the current internal resolution of the game, click "Guess Current Resolution". b. If the game does not respond to your resolution changes, click "Attach", and try again. c. To set a custom internal resolution, type your values in the Horizontal/Vertical boxes. Make sure that this is in the aspect ratio of your display, for the best visual quality. 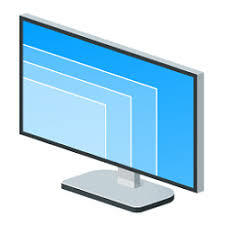 Then click "Apply Custom Resolution".